Over the years, I have found that I often gravitate towards young adult novels. While the characters might have a slant for that age group, the writing is often good and the stories just as compelling as some more ‘adult’ novels. 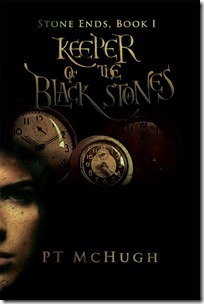 Keeper of the Black Stones by P.T. McHugh is one of the more recent young adult novels to enter our house and it’s definitely a “keeper”. Jason Evans, a shy, introverted high school freshman, thought that his mundane life was all there was – girls, golf, physics, and the occasional bully. Until he found out about the secrets his grandfather had been keeping from him … a set of stones that allowed them to jump through time … a maniacal madman who used the stones to shape history to his liking … and Jason’s role as one of the few people in the world who could stop that man. Against impossible odds, a fourteen-year-old boy must take up his legacy, learn everything he needs to know within one short day, and travel helter skelter into the Middle Ages, to join Henry VII’s fight against Richard III, end the Dark Ages, and stop the man who now holds his grandfather captive. In this romp through history, Jason and his friends must race against time to accomplish not one, but two missions. PT McHugh didn’t start out as a storyteller. He was, however, born into a family of that encouraged imagination. He became a fan of history in school and then went to college to become a construction engineer, to build a world of straight lines, angles, and equations. I truly enjoyed this title and will admit that I am seriously looking forward to more in this series. The characters are lively, the settings and time period are described well enough that someone not versed in that time period of history can still envision it. And, the premise will allow for this series to be long lived if the author chooses to do so. With so many spots in history where the villain can travel and attempt to alter the course of history as we know it, the possibilities are practically endless! After I read the title, I passed it onto R for some ‘free reading.’ He read the title over a few evenings and proclaimed it ‘good.’ He did clarify that it wasn’t quite as exciting of a story compared to the Lord of the Rings or Inheritance series, but more than many of the popular books he’s read in the recent past. The time period visited by the main characters was one that intrigued him as he has always enjoyed learning more about the Middle Ages. I’d definitely recommend this title to anyone with a child in grades 5 and up that enjoys science fiction or fantasy stories. The time travel aspect lends a wonderful backdrop for what is also a story of relationships and doing what is right. Curious what others are saying about this title? Visit the Keeper of the Black Stones tour page on Pump Up Your Book to find out! « Spring Fashionista 2013 Lookbook is Here! This sounds like something I would enjoy reading. I love these types of books, will have to check it out! I definitely have an affinity for time travel stories, Michelle. Add in a time period of history that I love and it's a win-win situation. I'll be curious to see how the next one plays out in the series. Sounds like an interesting read! Something my nephew may like. I'll share this with him. I have a long "to read" list but this looks like one I have to add to it! Sounds interesting and I am a fan of the middle age genre! This books sounds interesting. I love books with a historical slant.